Alyce has picked up a new interest, Legos. She's built with them since Duplos but has now taken a serious interest in them. 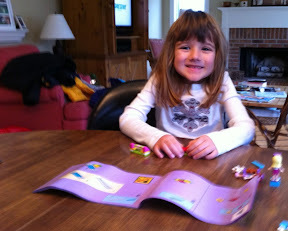 We've put a few of my sets together and even though the instructions were tough she managed them well. Today we picked her up her own set of Legos. 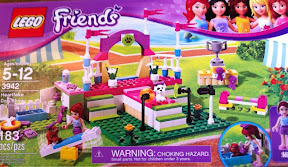 It's from a new line that Lego put out expressly for girls called Lego "Friends". Gone are the blocky mini figures and here are cute little girls with names like Stephanie and Mia. Also a lot of the blocks are more girl friendly colors like pink, purple, and fuchsia. The sets are also girl friendly too. Some people are up in arms about the whole thing. Saying that Lego is pandering. People vote with their credit card and from what the shelves looked like today the general public likes them. Alyce had been asking for these since seeing the flyer in the mail. She's also taken to building things in her room during quiet time. The aspect we like the most is that Alyce is staying in her room playing in the morning rather than waking us up! As we were walking out to the car Alyce said "thanks Mom" and gave her a hug. Putting the set together at Grams and Papas house was a lot of fun. Alyce assembled just about everything herself. I only helped locate the parts and checked to see if she missed a step. Mom and I went out to see a movie. When we got back Alyce was playing with her new toys and even now an hour later she's still going at it. I'm playing with her some. 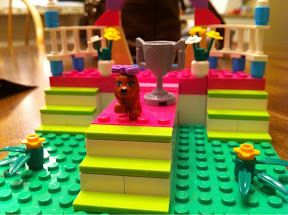 We took turns being first place in the dog show. Her dog is called White Polka Dot and mine is called Graham Cracker. 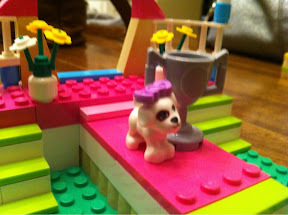 0 comments on "Lego Friends"